T-Minus 26 Days and Counting! I’m so sorry to my loyal readers out there! I’ve been a terrible blogger over the last month. Things became insane with packing up my apartment, saying ‘see you later’ (I refuse to acknowledge that it could be good bye) to my friends and home for the past 6 years, and then settling myself back in Cincinnati only to move AGAIN in 26 days! Gah- talk about busy! I am setting a reminder on my new phone (!) to remind me to blog more. A whole month is just unacceptable. Oh well, here goes my penance! -Back in DC my friends managed to go all over the city with me in my quest for awesome food including Indian, Belgian, Italian, and many other varieties of food. We played mini golf at the H St Country Club Bar, partied on the rooftop of the The Brixton and in the backyard of Dodge City, while also experiencing the incomparable Little Miss Whiskey’s. Can’t forget our one last trek down 18th St in Adams Morgan for the memories. The ophthalmologist office where I worked as a receptionist this summer also threw me a going away party. Needless to say, July was a busy month! I ended the month by helping move my two wonderful roommates (Hi Marissa and Alisa!) to their new apartment in Bethesda, followed by my parents arriving in DC for an all too brief weekend to pack me and my belongings to head back to Ohio. With the help of my Mom in a caravan, I drove a Uhaul filled with my belongings and my car back to Ohio. Driving a Uhaul through the mountains of West Virginia was an adventure to put it mildly, but I did it! I’d even hazard to say it was less scary than driving the Uhaul through Capitol Hill when picking it up. 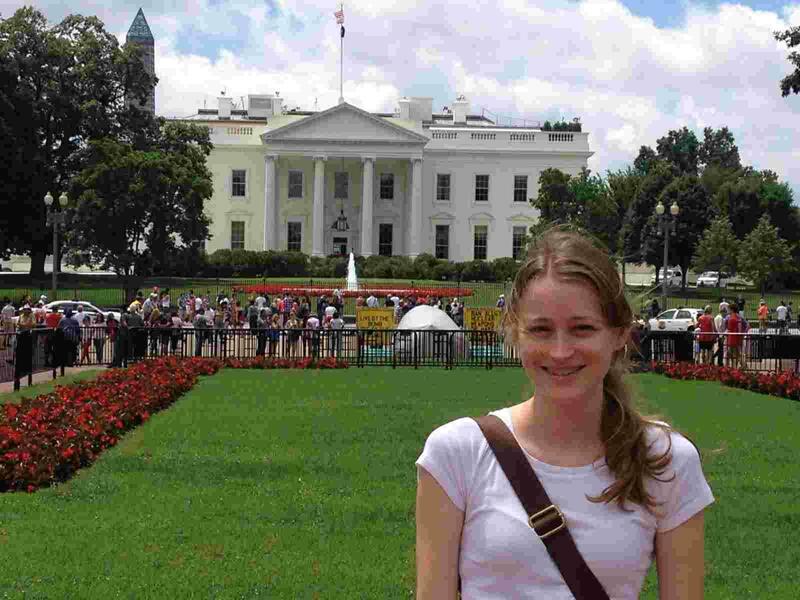 I leave you with a photo of me in front of the White House. It was taken by my dear friend Jon on the morning of the 4th of July. We decided to stop spur of the moment after getting bagels and before we headed to the Zoo and a BBQ. All a normal part of living in D.C….